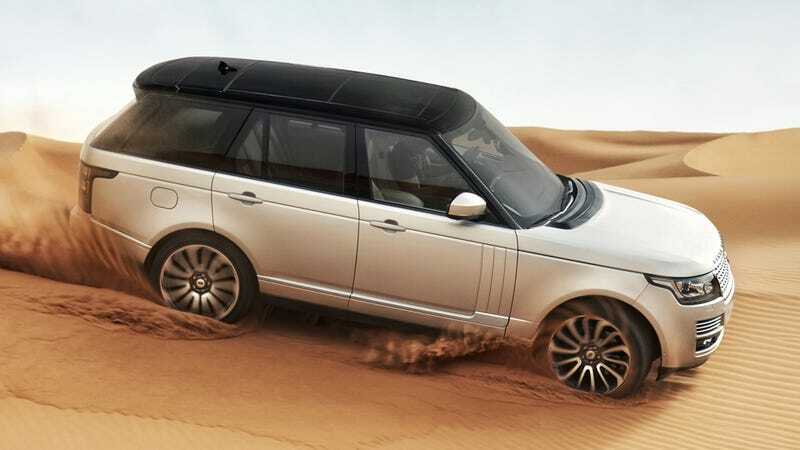 The new 2013 Range Rover drops roughly 700 pounds for the US market. That kind of weight loss isn't healthy for most humans, but it's just the kind of development we like to see in cars. There are no cheap diet pills for the Rover. It gets a new aluminum body as well as aluminum front and rear chassis structures. It's less like a gastric bypass and more like a workout regimen. The Rover loses a lot of its toothy chrome and assorted bling along with all those pounds. It gives the SUV a cleaner look, a lot like the new Ford Explorer. What the Range Rover gains is 4.7 inches of rear legroom, some new offroading software, and an updated air suspension system . Land Rover hasn't given out any drivetrain info, other than that we'll get the already-available line of V8s and the 8-speed auto. It looks like this Range Rover is going to be largely the same thuggish, desirable Luxobarge it's always been, only complaint with new fuel economy and emissions standards. Thanks, Land Rover, for doing it all properly with some lightweight engineering and thanks Autoblog for coming early with this information!